Summer and BBQ seem to go hand-in-hand. Here in San Francisco, summer usually waits until August to usher itself in, yet we find ourselves in the middle of an unseasonal heat wave right now. At my sister’s today, just a couple of hours outside San Francisco, it was 104F. And despite the oppressive heat, we barbecued. That’s just how it is. 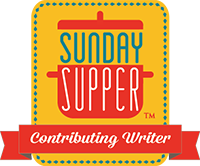 With the July 4th festivities right around the corner, the #SundaySupper crew decided to throw a virtual BBQ, and Jennie over at the Messy Baker Blog is hosting. 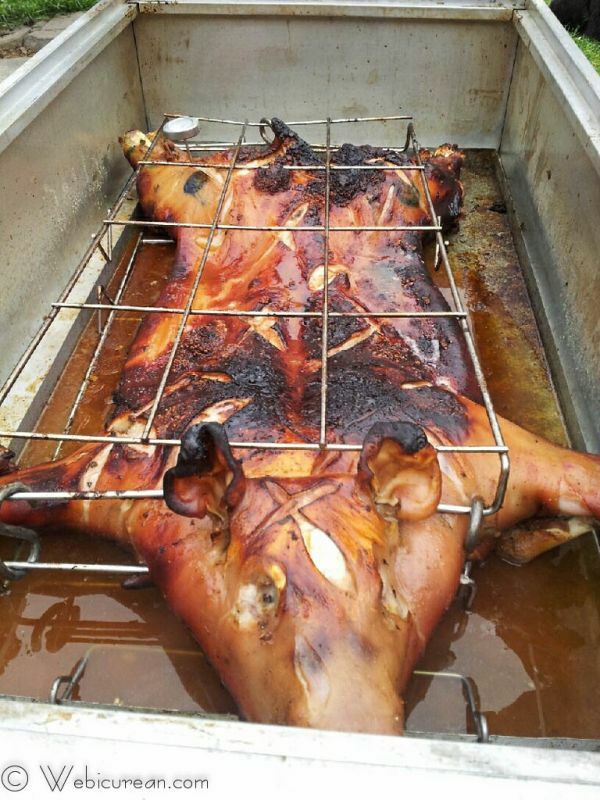 To make this event extra special, I’m barbecuing the whole hog. Actually, I wasn’t the one who did the barbecuing this time. The recipe was conceived and executed by my niece’s fiance, Dave, with their friend Maureen adding that Cuban flair. Dave is quite the grill master. Every year he throws a BBQ for my niece’s birthday, usually featuring an array of grilled meats and sausages as well as whatever fish he caught that day. This year, he wanted a challenge and decided to BBQ an entire pig, allowing me to document the process for this article. Good thing I did–this was a lot of work, and it’ll be a long time before he does it again. 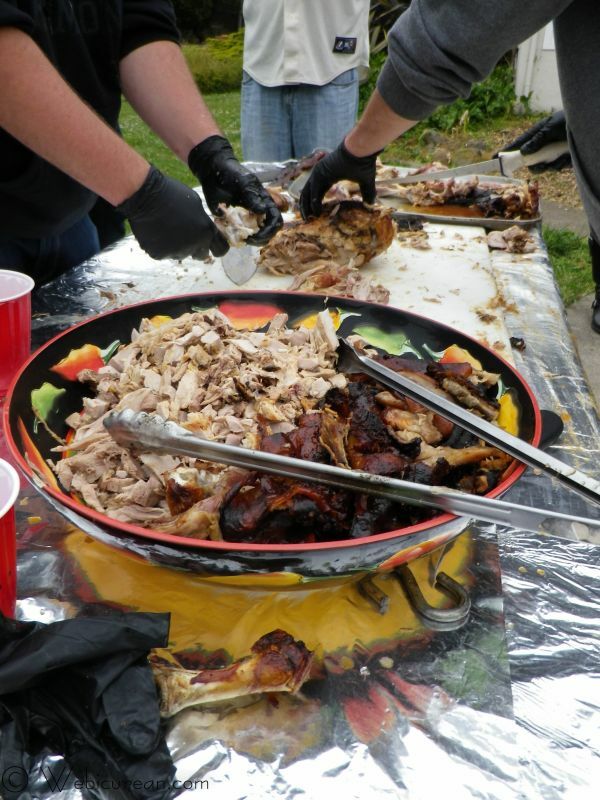 The entire process was quite the spectacle, in a good way, and the end result was an enormous bowl filled with juicy pulled BBQ pork. Despite calling dibs on the cheeks, they disappeared quickly without a trace. I didn’t mind so much, though, as the rest of the meat made for a delectable sandwich. 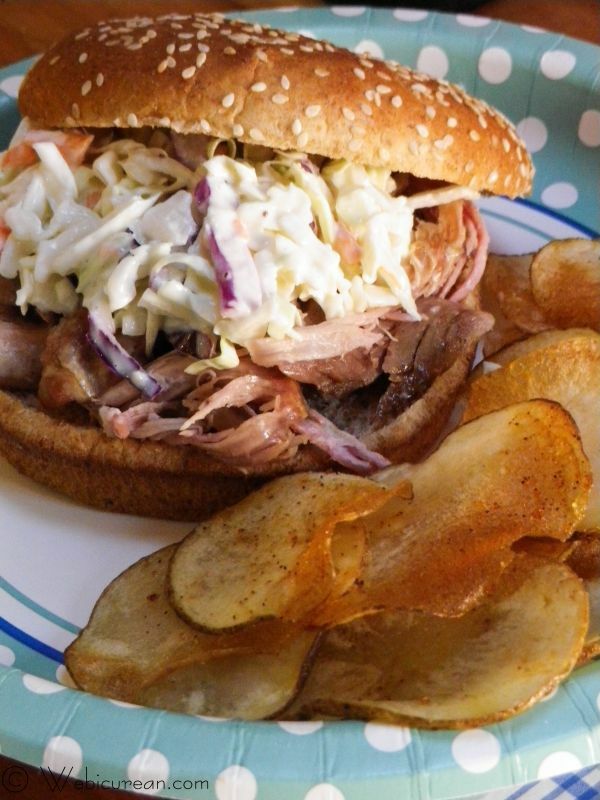 Dave had made a large bowl of coleslaw, so we piled that in the sandwiches as well. That was some good eatin’! A couple of weeks before your shindig, you’ll need to order the pig. Have your butcher take care of all the gutting, cleaning, trimming, and butterflying.Â Pick it up a couple of days before your barbecue. This pig was about 45 pounds. You’ll need a clean working table (cover it with foil),Â latex gloves, a very large cooler, and lots of ice. Once you get the pig home, you’ll need to rinse it off, then rub it all over with the Adobo Seasoning. Place it in a cooler packed with ice, and let it sit overnight. On the next night, prepare the marinade, then inject it into the pig all over, return to the cooler, repack with ice, and let sit overnight. Here are some injecting tips. The morning of the barbecue, inject more marinade into the pig. About 30 minutes or so before you’re ready to start cooking, get the charcoal going.Â While the charcoal is heating up, remove the pig from the cooler, and rub all over with the crushed garlic. Secure the pig in the racks with S hooks. When the charcoal is ready, remove the charcoal grid from the pit, and place the pig inside, ribs side up. Cover with the charcoal grid, and cook for about three hours, adding charcoal per the instructions here. After about three hours, remove the charcoal grid, and flip the pig over. 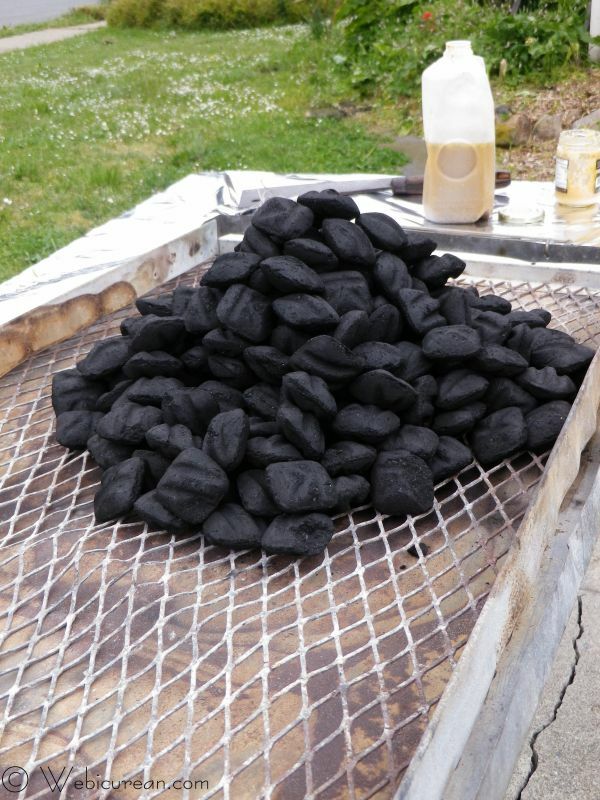 Score the pig’s skin, then pour on any remaining marinade, and return the charcoal grid to the top. Cook for an additional 30 minutes or until the skin reaches the desired crispness. Have a clean work table ready, and when the pig is done, place it on the work table. Put on those gloves, and start cutting/pulling the meat off the bones after letting it rest a bit. Best served in a roll and topped with copious amounts of fresh coleslaw. 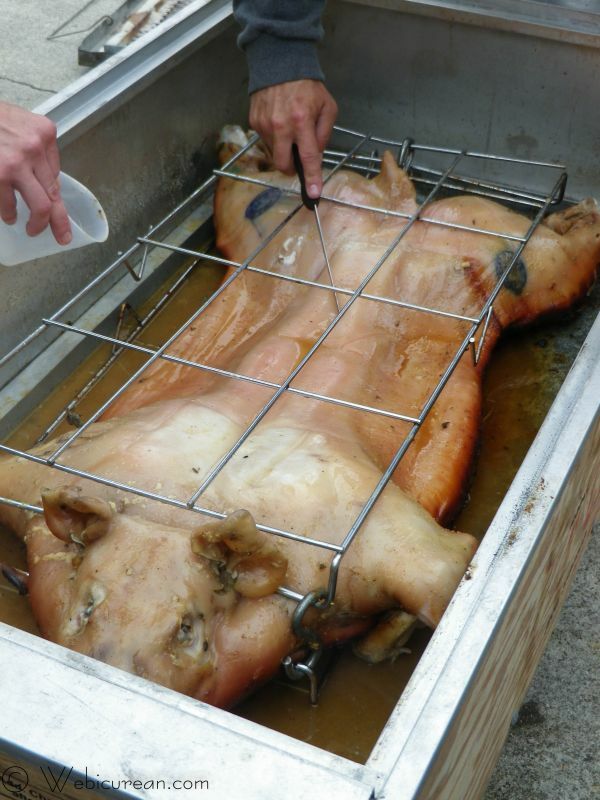 Learn how to BBQ the whole hog and impress your friends at your next garden party. Mix all of the ingredients together, and use as a marinade or inject into the pig. Pick up the pig two days before your cookout. On the first night, rub entire pig down with Adobo Seasoning. Place in a cooler with ice and let sit overnight. The night before your cookout, prepare the marinade, and inject into the pig all over. Return to the cooler, repack with ice, and let it sit overnight. The morning of, inject the pig with additional marinade. Preheat charcoal in pit/roasting box. Complete rub down the pig with the 1 cup of crushed garlic. Place the pig between two racks, securing at each corner with an S hook. Remove the charcoal grid from the box. 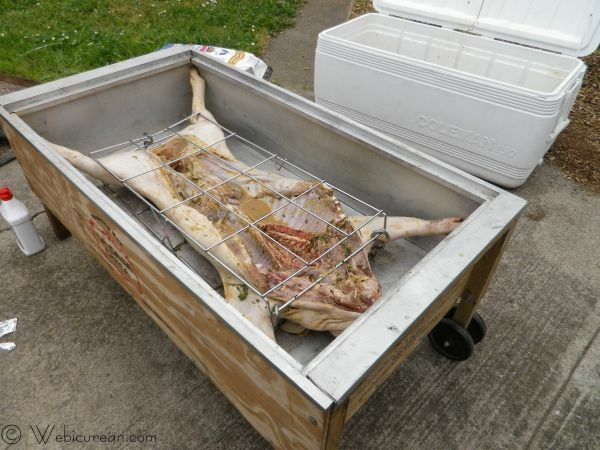 Make sure the drip pan is in the roasting box, then place the pig inside the box, ribs side up. Pour half the remaining marinade over the pig. Place the ash pan over the pig to cover the box, then place the charcoal grid back on top, spreading the charcoal evenly across the top. You will need to continuously add charcoal per the instructions on the roasting box. After the third hour, you'll need to remove the charcoal grid, and flip the pig over. Score the pig's skin all along the back, then pour any remaining marinade over the pig. Return the ash pan and charcoal grid on top, and cook an additional 30 minutes or so until the skin is crispy to your liking. When done, transfer the pig to a big table where you can pull apart the meat. Be sure to use gloves for this! Let’s see what everyone else is cooking up! Wow! What a great idea for a BBQ!! Those are some pretty intense photos, I must say. Thank you Mr. Pig! It looks like you were the host of quite a party! Those sandwiches look completely delicious!!! I would kill for a piece of that skin. Jen @JuanitasCocina recently posted..Bleu Cheese Burgers ~ Summer BBQ #SundaySupper! Now THIS is how you have a barbecue!! I went to a lot of hog roasts growing up in Iowa. Thanks for sharing the technique…the end result looks delish!!! 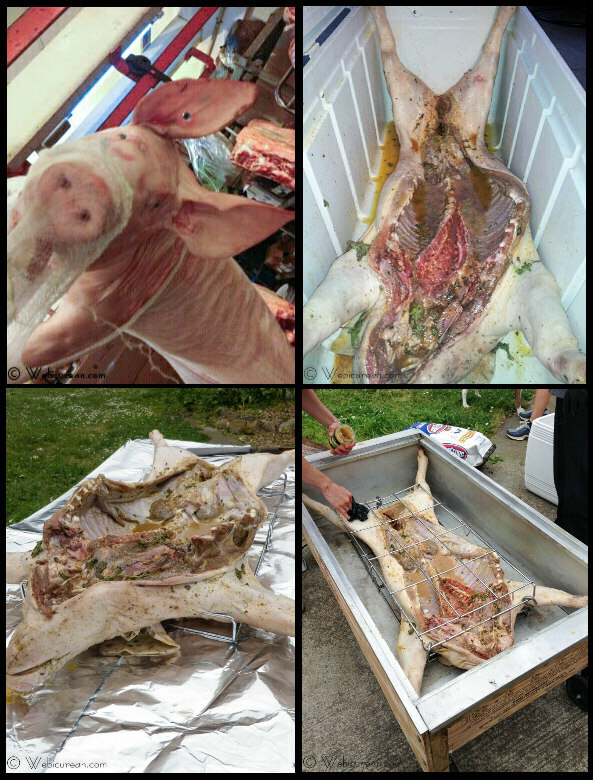 I would seriously think about buying a plane ticket just to be there the next time they BBQ a pig like this again. I love pulled pork… that is probably an understatement. I LOVE pulled pork!! Thats about right… This is such a long process, but the end result is just amazing, spectacular sounding, scrumptious. Yum! Amazing! It takes a lot of patience and courage to bbq a whole hog, but itÂ´s SO worth it! We eat it a lot for xmas, since itÂ´s summer here. But most usually buy it already divided in pieces, from shops that grill the whole thing. ItÂ´s done in bakery ovens too! I am so impressed. This is quite a feat! My family had hog roasts quite a bit growing up for family reunions and graduations, but we always had a professional come do it. Did you make your own BBQ for this too? I’m just…wow. You win. Wow, this looks fit for a medieval banquet! Impressive work! We go to a pig roast every September at our neighbors across the street. It is fabulous. Yours looks so good too!! Quite the feast!! What an interesting post, as I’ve never really seen this first hand. And yes, the end result looks and sounds delicious! Thanks for sharing. I have been waiting all week for this recipe. I am so jealous right now. This is one good lookin’ hog. Thank you so much for sharing such an amazing recipe/experience! Holy moly – now that is a party! This is pinned and I can’t wait to try it. It is one of the things on my culinary bucket list!! My wife would so throw up if I did this at home. lol. Honestly, I am in awe. This is definitely on my cooking bucket list. What an amazing effort and a result that I’m sure blows one’s mind. Thanks for documenting and making the rest of our Sunday Super BBQ recipes look like child’s play. You are a brave person! I’ve had a whole roasted hog before but I’ve never been brave enough to do it myself. Kudos to you! This is something I really want to do at some point. I’ve only seen it done once, but the result is some amazing meat! Thanks for sharing the process! This looks like it was so much fun, and I am so impressed! 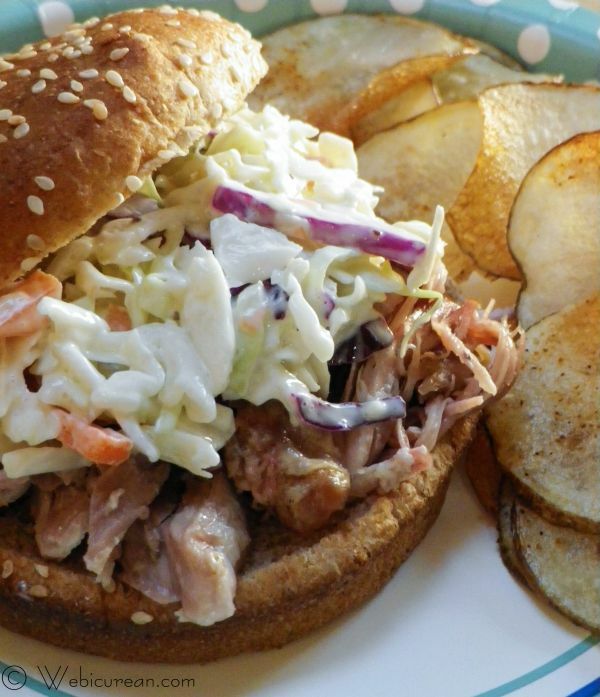 Those pulled pork sandwiches look incredible! If that was me I’d be sitting at the table before they started carving to get those precious cheeks! Still though, it sounds like a fun day and an incredible meal! oh, wow .. you guys don’t mess around. . some of those photos were a little too much for me. . but it’s like being in Hawaii!!! your sandwiches look delicious!! I absolutely love a good pig roast! BBQing that Hog seems like a really long process! Its looks delicious but be careful with the cholesterol! Haha. It *is* a lot of work, that’s for sure! But it’s a fun centerpiece to have at a gathering… I hear ya about the cholesterol–everything in moderation, I guess!